A: Your panes will be polished by a team of licensed and police-checked window cleaning specialists. Q: What services does window cleaning Addington offer? 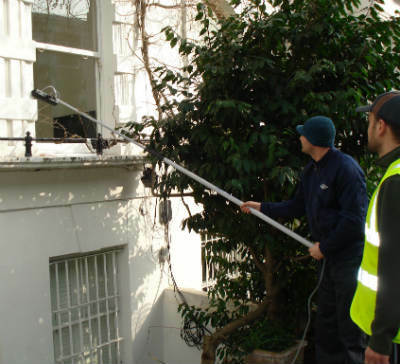 A: The experts will achieve exterior window cleaning with the help of modern water-fed pole equipment on the market. For buildings above the fourth storey, we'll send in experienced abseilers for rope access window cleaning. For inside pane polish, the team will employ standard ladders and sponges. A: A handful of raindrops won't disrupt the Addington window cleaners' work – rainwater is usually deposit-free. However, if we face a cloudburst, then we will kindly ask you to hold off your session for another day. A: Yes, any PVC or UPVC frames and sills that your building features will be treated with no extra charge as part of our service. A: As long as the cleaners can walk past your front gate, they can rinse away all muddy streaks without you having to be present. If your panes need a thorough in-house polish as well, then we'll perform a quick key pick-up and delivery service. A: Usually, the purified water container inside the team's washing caravan is always full. In case the tank is empty and with your permission, the technicians can painlessly link the water-fed pole to any accessible water source. Q: Do I need to meet any specific prerequisites before the team arrives at my doorstep? A: Once we tell you that the team's on their way, you'll need to make sure that they can enter your domain unimpeded. In addition, the technicians will require a parking space within 30 metres from your property and on the same side of the panes you want treated. A: If the team is nowhere to be seen because of intense traffic, we will inform you about the setback and call you as soon as they arrive. For the last decade, our window cleaning Addington service has always delivered efficient results at the most fair prices in your area. You can check our prices in our short price table below. With window cleaning in Addington, we can improve the appeal of your premises even if it scrapes the clouds above. Let's review what you'll get once you book our adaptable service. For exterior window cleaning, the Addington window cleaners will utilise a expandable water-fed rod. A water pump inside the team's van will send filtered water up the hose and out of a brush-head add-on. The water, in conjunction with the brush-head, will erase any traces of mud from the casements of any four-storey building. With rope access window washing, the specialists will use sturdy abseiling gear to reach even the highest floors in your commersial or residential property. We possess all necessary COSHH documentation and risk evaluation reports and can send them to you as soon as you need them. In addition, we regularly check the cleaning gear to ensure that your booking will go according to plan. And to dight every inner corner of your panes, the proven team will use the established sponge and ladder cleaning procedure. We are happy to announce that our window cleaning in Addington has been requested by several adjacent areas as well. You can see which locations we cover below. Another quick and easy way to get a free instant quote or to book window cleaning services Addington CR0 is through our web site.